I’m currently working on a plugin for Adobe Animate CC and Adobe After Effects which I have nicknamed “Play.on”. It will allow you to build interactive HTML5 based media using visual programming. This media can be used for things like playable ads, mini-games, interactive web apps, banner ads, the list goes on. You can choose from a library of templates and customize it to suit your needs. 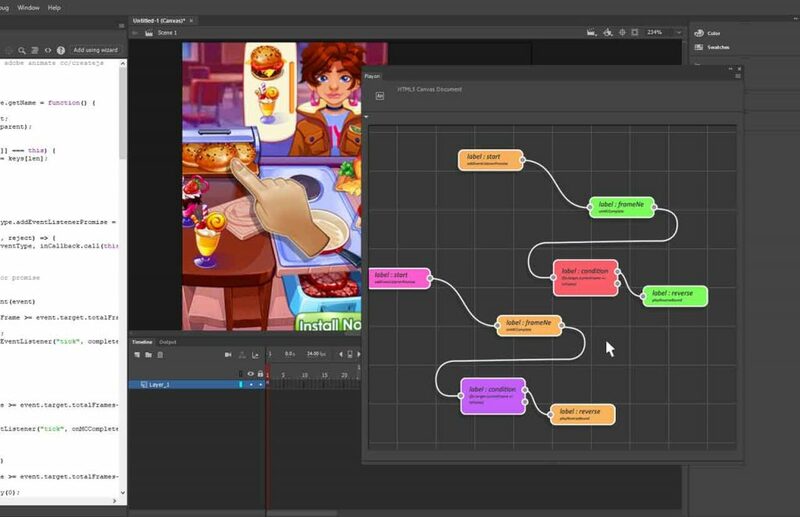 The cool thing about this workflow is that you will not need to be a computer programmer to create a robust interactive experience. The concept is to use a node-based network to build and visualize an interactive experience. You design the experience using a series of nodes along with simple logic streamed together in a graph using Adobe Animate CC and Adobe After Effects. And as the platform grows, you can extend the plugin by simply adding more nodes. I am also working on building a node for supporting dynamic content so that one can use third party data feeds for things like keyword contextual targeting, geolocation, and campaign data can be fetched and used to determine what kind of experience will be delivered on the fly. Pixel Cloud version 1.0 has updated its installer for After Effects CC. The plugin itself is the same between CS6 and CC actually. However, since the file path conventions are different because it is “CC” and not “CS6” the installer was updated to accommodate this. You can download the new version from AEScripts. In related news, I am currently working on version 2.0 of Pixel Cloud and will be happy show off what’s new with this update! Version 2.0 will be a free update for version 1.0 owners! A new tutorial video is in the works as well as some new scripts and other goodies. At some point in the near future these updates will be coming quick so stay tuned!